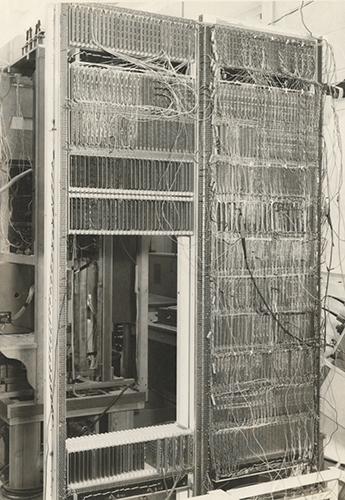 This is a black and white image of two vertical racks with circuit boards installed throughout. At the top of the rack is cabling to interplay and special register system. The equipment in the middle is the special register distribution, 1401 channel control, interrupt, and 1401 interface adapter. The bottom of the rack contains power supply amplifiers and a 1401 terminator. Written in text on the diazo type drawing is "Figure 7", "Cabling to Interplay and Special Register System", "Special Register Distribution", "Interrupt", "ICC 7 1401 Channel Control", "1401 Interface Adapter", "Special Register", "Power Supply Amplifiers", "and 1401 Terminator".